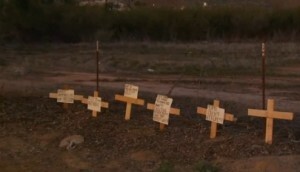 LAKE ELSINORE, Calif. — At least half dozen crosses have appeared along a roadside in California after a humanist group convinced city officials to order a grieving family to remove a cross memorial from the same location, asserting that it violated the separation of church and state. The family of 19-year-old Anthony Devaney erected the five-foot cross along Lake Street in Lake Elsinore in 2012 after the teenager was struck and killed by a 17-year-old driver. However, due to a recent complaint, the American Humanist Association (AHA) in Washington, D.C. contacted city officials this month and demanded that the cross be removed. The organization contended that the memorial presented a “serious constitutional violation” because it was displayed on city property, and thus served as a government endorsement of religion. According to reports, the city had removed the cross late last year following a complaint, but the Devaney family returned it to its location. Noticing that the cross had been restored, the unnamed complainant again expressed their grievance over the placement of the memorial. The city responded to the complainant and the AHA by assuring that the cross would be removed by mid-March. But the Devaney family opined that the parties were overreacting to the tribute to the teen. As the family removed the cross last week, Ann Marie told reporters through tears that the occasion brought back a lot of hurt and pain. However, much to the surprise of the Devaney’s, a number of supporters showed up with crosses of their own and planted them in the ground. Also present to show support was the stepmother of the teenager who struck Devaney in 2012. Laurie Howanec stated that she believed the demands of the American Humanist Association were wrongful, and came to stand up for the Devaney’s. It was her first time to meet the family. As previously reported, AHA had also filed a lawsuit against the city of Lake Elsinore last year, taking issue with a veterans memorial that includes images of headstones that are in the shape of a cross. “[We are challenging] the constitutionality of the City’s design, approval, funding, construction, ownership, maintenance and prominent display of a monument … depicting a soldier kneeling before a Christian cross as a violation of the separation of church and state,” the complaint outlined.